These venison appetizers are so good, folks will not believe that you used deer meat. Venison is not just for dinner anymore. My appetizers are delicious - so good, that you could make a meal out of them. Perfect for serving at football games, parties and get-togethers. You may make it in a 9x13 inch pan or a large platter. Mix the above two ingredients together and cover the bottom of your serving plate completely. Then pour taco sauce over the cream cheese mixture. Fry the ground venison with the taco seasoning adding 1 TBS water. Drain fat, and sprinkle over the taco sauce. Restaurant style tortilla chips or lime flavored chips are used to dip into this delicious dip. Nothing beats this venison appetizer. Find out how to make corned beef out of a venison roast below. 16-ounce can sauerkraut, drained, squeezed, dried (link to recipe below). 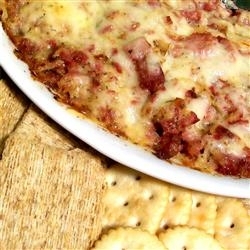 The next one of my venison appetizers makes a savory and delicious dip - so addicting. 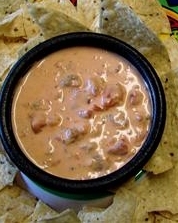 You may also use Rotel tomatoes for the fresh salsa. Brown your ground venison with the taco seasoning and drain; set aside. Spread all of the cream cheese in the bottom of a baking dish. 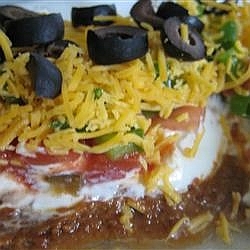 Layer with 1/2 of the fresh salsa and then 1/2 of the ground beef mixture. NOTE: You may make this dip in a crock pot. Brown the ground venison with the taco seasoning and mix it with all of the other ingredients until hot. Serve with tortilla chips (below). Not just for venison appetizers, these chips have less fat and are wonderful with my dips and salsa.